Jaylen Waddle returned a punt 63 yards for a touchdown and caught two scoring passes, including a 94-yarder to lead the way for Crimson Tide (5-0), who won profoundly for the fifth straight time this season. Quarterbacks Tua Tagovailoa and Jalen Hurts were very instrumental in helping Alabama piled up a one-sided 49-0 halftime lead over the Ragin’ Cajuns (1-3) before cruising home. Tagovailoa completed all eight of his attempts for 128 yards and two touchdowns, while Hurts went 4 of 6 for 118 yards and threw a 54-yard touchdown pass to Henry Ruggs III. Ruggs III finished with two TD receptions for 116 yards, while Waddle ended with 138 yards from three receptions. Trey Ragas rushed 16 times for 111 yards and a score for Louisiana-Lafayette in the defeat. With Hurts suiting up for the fifth time, it erased any question about hime possibly taking a redshirt year and moved elsewhere next season. 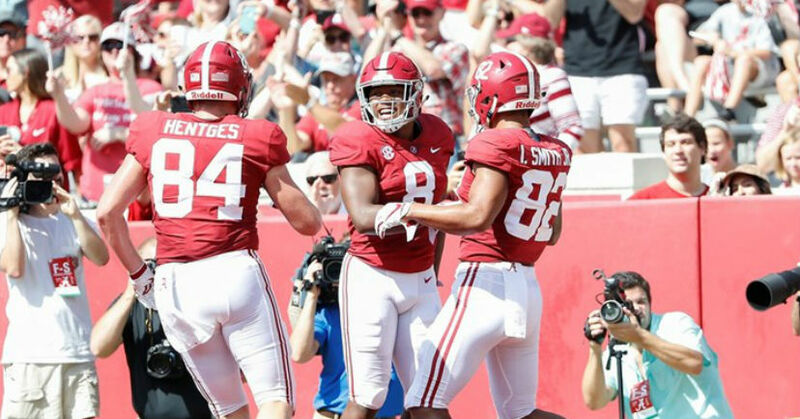 “Jalen obviously handled this extremely well relative to being a great team player, great team leader, respecting his teammates and sticking with the program here,” Alabama coach Nick Saban said.